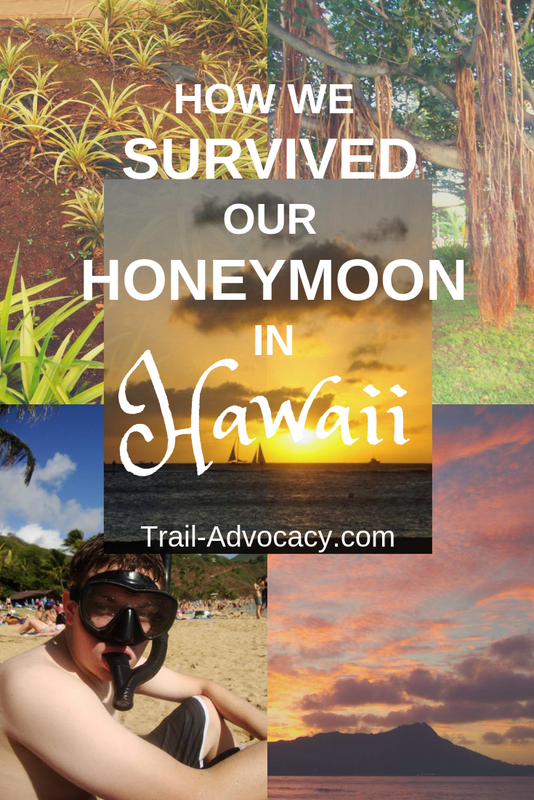 Our Hawaiian story is filled with great memories, and one exceptionally bad memory. To echo our newly minted vows, it was our first test as a married couple traveling in sickness and in health. There is nowhere like Hawaii. It has everything–beaches, mountains, city nightlife, culture, incredible and varied foods. Neal and I chose it easily as the destination for our honeymoon. But we couldn’t afford it right after the wedding, as we had just spent almost five grand on it and we were drained. (Check out post on our wedding in Sedona, here!) A year and a half later, I was in law school and Neal was working his 9-5. Full of stress and student loans, we decided it was time to go! The flight from Boston to Hawaii was comically long. It felt like it would go on forever. We stopped in LA after 6hrs, thank god, and then had another 6hrs to Oahu. The moment you get close to the islands, though–and you see them from the plane–you know it will all be worth it. The only thing I would change is that it was in the city part of Waikiki, not on the beach. I would go with something closer to the action and out of the city next time! Our very first plan for the day was to get a couples massage and dinner. What could go wrong? The couples massage and the dinner, that’s what. It was actually Neal’s first massage. He didn’t know what to expect, but I did. You expect calm music, soft lotion, aromas and oils. After a great massage, you’re relaxed and loose, feeling good. What you don’t expect is your masseuse to jump up on the table and walk all over you without asking if you have any past injuries! Or if you wanted that type of massage! And when you’re shy and young, you stupidly don’t fight it. What do we know about the proper way to give a massage? I’ve only had one massage like this since, and I immediately asked for a different type. They’re not my thing. Turns out, it wasn’t Neal’s thing either. We went to dinner feeling half broken. We stopped at a nearby hamburger place. No one was there – maybe that should have been our first clue? We thought nothing of it and sat down. The food was okay. Nothing special. Or so we thought. By the time we got back to our B&B, Neal could barely walk. He spent the next 2 days in bed, weak, throwing up and everything else. I thought at first he was just being a baby about a little food poisoning, but I was sorely mistaken. No one would choose the bed over that beautiful island! I walked around a bit by myself, but I felt terrible leaving him. So we spent the first two days of our honeymoon with Neal sick as a dog and me reading by his bedside. Finally, Neal was feeling better. It was time to unleash ourselves on the island. We felt like we had a lot of lost time to make up, so we did not waste a second more. Here are some of the things we enjoyed most! In Hawaii, there is endless beauty, but the sunrises and sunsets are especially incredible. You don’t have to go anywhere special to see it–just head to the beach! On Oahu, you can watch the sun peek over Diamond Head’s imposing peak, or watch it sink into the ocean with a cocktail in your hand. In the morning, we would run to the beach or eat an early breakfast and watch the sun come up. At night, we would sit with our toes in the sand as the sun sank deeper and deeper into the horizon. We are big fans of sunsets and take a lot of NYC sunset pics. But Hawaii just about has NYC beat! Oahu has dozens of incredible hikes. We did two–one everyone told us to do and one we found when we randomly got off the island’s public transportation. As we continued up, we walked through a tunnel that led to a winding staircase. At the top, we saw Honolulu in the distance and, of course, the ocean, where a surfing competition was taking place. It was so cool to watch them come in on the waves and idyllic for our first real Hawaiian day. The hike was relatively easy and well worth it. The second hike we did was Hau’ula Loop Trail and the Maakua Ridge Trail. We found it by getting on the bus, jumping off at a random stop and then making our way to Hau’ula Homestead Road. At first, we had issues finding the trailhead since it is not visible from the main road and there were no signs except the one warning to beware of thieves. The sign didn’t frighten us off though and neither did the beat up houses, packs of dogs, or gun-carrying hunters coming back from the forest. (It’s easy to think of Hawaii as nothing but the beach but there is so much more to it and the people who live there.) Despite the signs and sights, we didn’t have any problem at all. We were rewarded with an awesome hike that had almost no one on the trail. We were very lucky it didn’t rain. We were alone most of the time on this trail and had a blast. Neal and I are NOT beach people. We are forest people. But when in Rome, right? There are so many beaches and coves around Hawaii and snorkeling is a must-do! You can rent equipment right on the beach. We had our first snorkeling adventure at Hanauma Bay. It is a GORGEOUS bay and really fun to say. We walked into the water with our gear on. From the surface, you can’t tell there’s anything in the water. Once you dip your head, though, you see a TON of fish. It freaked me out at first, honestly. Why can’t I see them from the surface?? Are they going to bite me?? We also had to get used to breathing through the snorkel and not running into each other as we floated on the top of the water. All in all, it was such an awesome experience! While underwater, I scraped my knee on some coral. It bled a lot, but I survived. All of the fish were so cool and somehow I didn’t get a sunburn. As you can see from the photos, we could use a little sun! Oh well, maybe next time. A popular stop in Oahu is the Dole Pineapple Plantation. To be honest, we didn’t know anything about pineapple beyond what you can learn by eating it and didn’t think there was much more to know. Going to the plantation ended up being a pretty cool up close and personal way to learn about pineapples. There are several varieties that all grow in different ways! We also took a break to check out the koi fish here. There are a lot and they make a really disgusting sound when they bounce off each other! I mean, really disgusting. Like still haunts my dreams disgusting. But it’s cool, they’re bright orange! They can do whatever they want! Seeing all the different types of trees! One thing you’ll notice around Hawaii is that there a lot of really interesting looking trees. The Banyan trees are my all time favorite. They are so cool! But these painted trees are awesome too! While we were in Hawaii, we thought we should learn a few words in Hawaiian. It’s a beautiful language that’s heavily focused on vowels. We were there at Christmas time and learned Mele Kalikimaka means Merry Christmas. We also had a tour guide at one point who told us the Hawaiian words for different objects/places as we toured around. It was great fun! We weren’t optimistic about food after the food poisoning incident. I am happy to report that we moved past it to end up eating at some really amazing places. One of our first stops was to get an acai bowl. Hawaii was the first time I ever had an acai bowl and once I had one, I had one every day. They are absolutely delicious and filling. I’ve eaten many on the mainland since, but they just aren’t as good. If you get sick of acai bowls (but you won’t! ), you can grab breakfast at one of the many beach-front hotels. The food, the view, and the service were great at every place we ate at. Various Asian foods also thrive on Oahu. The Japanese food in particular is great. We love udon, and our favorite udon place on the island was Marukame. They make it in front of you and you take it to a table to eat. They had a veggie option, it was affordable, and the flavors were to die for. 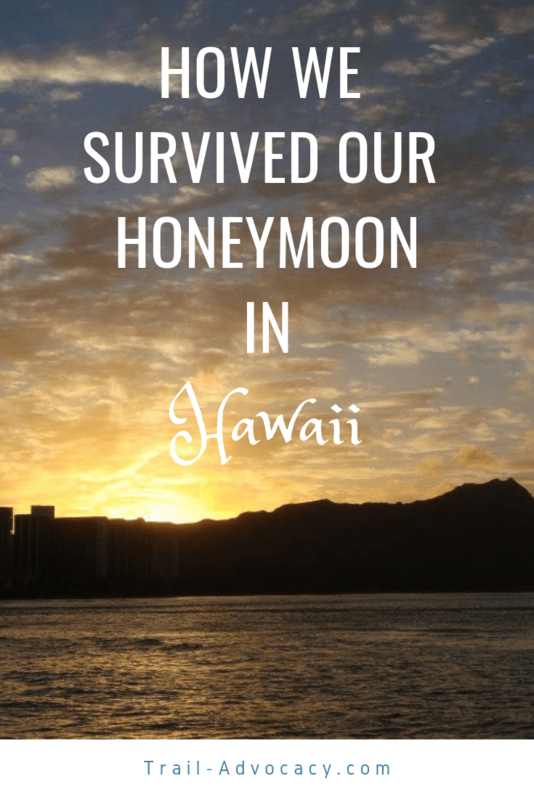 So that was our honeymoon in Hawaii. There were good times, there were bad times. We definitely got a lesson in traveling in sickness and in health! An initial dose of what marriage is. And they lived happily ever after! Oh my goodness I couldn’t believe my eyes when I read this! It was like reading my own honeymoon experience! My husband and I honeymooned in Hawaii too…but on the island of Maui and 15 years ago next month. We did have a massage experience although not like yours (but I love the Asian/Thai practice of walking on you…but they do need to ask your history!). But the shocking part…my husband also got food poisoning from eating a hamburger! It was so bad that 15 years later, he still is very wary of burgers and most of the time won’t eat them. 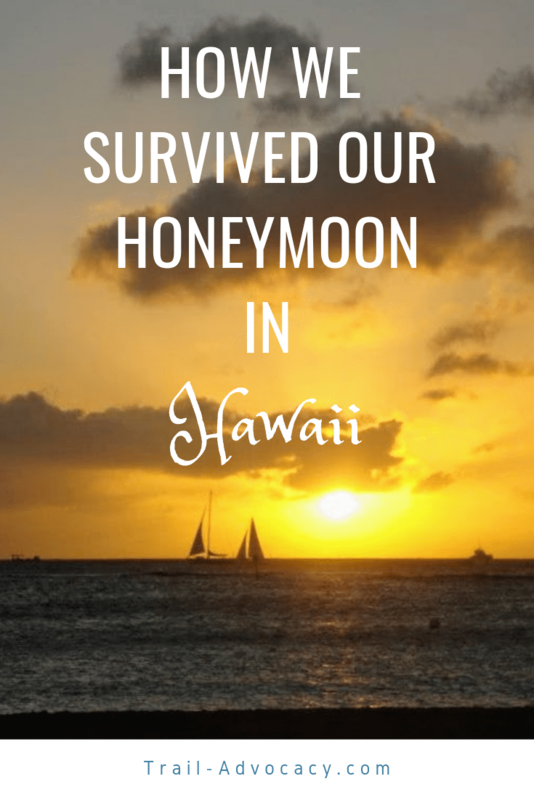 He was okay and we enjoyed our honeymoon and I see you guys did too….but wow! I love that you also mixed in your actual experience. Travel isn’t always sunshine and rainbows, but it still looks like you got to some awesome places. Hawaii is def on my list! Thanks! We’re trying to write out our narratives while giving people some great inspiration for their own trip. You will love Hawaii! Glad you survived your honeymoon and were able to get over it and still have some fun! On our honeymoon we did a snorkeling excursion with very rough seas. My husband got tossed into the rocks by a wave and lost his wedding band. He was devastated and it dampened the mood for the rest of trip. This was my husband’s first ever snorkeling experience and I though he would never try it again, but he did :-). We also got the worst sunburn of our lives there on a day where it rained non-stop, which was followed by a couple days of feeling feverish and not wanting to move. The hard times can make you stronger as a couple as long as you bond and learn from them. We laugh together about these experiences all the time now. Wow what an adventure! You definitely will be telling this story for years to come. Thanks for sharing! So glad you survived to tell the story! Despite the food poisoning, those hikes and the sunsets look like they made the trip to Hawaii worthwhile. You will always have a honeymoon story to tell – – the good, the bad and the ugly! I’ll tell you, I wanted to throw in the towel. But Neal rallied and we had such a good time. Thanks for reading! I love saying Hanauma too. It reminds me of the muppets. Wow, what a crazy story. Thanks for sharing! Sometimes we only talk about the good parts of travel, and it’s important to share both the good and bad. Haha yes! Every trip has its instagram moments and its character building moments if you know what I mean! Ahh, that’s too bad he got ill, that’s just the worst especially on honeymoon!! At least you were in Hawaii, I got food poisoning on a Vietnamese island it was the worst!! ha ha. It’s one of those things you look back at and laugh though! It looks like you guys still got to do and see some amazing places at least! Those bloody corals are sharp too aye! It’s so true! The sunshine helped us rally. Food poisoning is just awful! Thank goodness it doesn’t last too long. It’s sad that your honeymoon started on a bad note but I am glad that it ended on a positive note. You enjoyed your time there even after those initial hiccups, that is what’s most important. Yeah, we definitely want to try snorkeling elsewhere now! Hawaii is so beautiful and I love that the people who live there maintain a culture and language all their own. You had the ‘dodgy burger on a island syndrome’ as well. I know how that feels. I had it on Cape Verde islands and I was in bed for two days then had to do a 6 hour flight home with it as well. It was horrible. And it was on my wife’s 30th birthday! But I am glad you got the honeymoon recovered and done the beauty of Hawaii. Was there last year, loved it but my least favourite thing being a health freak was the food. More fatty stuff and meaty than I thought there would be. I agree on the food — I’m a vegetarian, so I was navigating the meat culture. I ended up eating quite a lot of Asian foods rather than Hawaiian. But those Acai bowls!! I am so sorry to read about the misfortunes on your honeymoon trip. Now I am wondering is walking on the person a part of traditional Hawaiian massage? Btw, usually after rough massages like you had one, people feel much better when initial weakness is over. But I agree, the masseuse needed to ask you about your health history. Thanks for sharing this post! I appreciate how honest you are. I think a lot of people sugarcoat their travels to make for a nice story but it’s refreshing to see so much honesty. I hate that you had this incident but love that you didn’t let it run your trip. It looks like you had a good time! That’s too bad about your massage experience!!! It’s totally unprofessional that they didn’t consult you about previous injuries or anything. But looking at your photos, it looks like you still had a great time regardless. Love the decor of your Airbnb and those sunrise and sunset views are just stellar!